~ "A House Is Not A Home, Without A German Shepherd"
Most all our pups are crate trained by the time they leave, sit on command and usually are doggie door trained! They will be up to date on vaccines & are treated with Heartworm & Flea prevention regularly. They will also have their rabies shot & tag if they are 12 weeks or older. They are usually all reserved by 4 weeks of age because we ONLY have a few litters a year with a huge demand for our puppies. If you are looking for a family raised puppy along with an amazing quality that's raised in the home, temperament tested daily, crate trained with loads of love, care and kisses... you have come to the right place! They constantly have hands on contact with myself, my daughter and 15 yr old grandson. They are always treated with respect and gets lots of hugs & kisses! Their is no puppy loved more than we give our babies! They are raised in our home with our loving family. We are very proud that our puppies have gone to police officers, homeland security, veterinarians, lawyers, doctors, many famous people and to absolutely wonderful loving homes nationwide. Their sire and dam are extremely loyal, gentle and super intelligent. All our puppies are bred to be loyal, loving, obedient and intelligent! If you choose to pick up your puppy, please be prepared to SPRAY THE BOTTOM OF YOUR SHOES WITH LYSOL before you enter our home. Our #1 concern is the safety of our puppies and for them to arrive safely if at all possible to their new families, secure and unharmed! Buy Dog Beds & Mats Today - Shop over 1,000 Brands at Chewy! IMPORTANT INFORMATION: If you would like much faster service please Text us at 256-605-0015 plus . . . Text us your name and let us know you have requested us as a friend on facebook along with 2 references, one being your vet and also let us know what kind of home you have to offer one of our babies! Please CLICK HERE To Add Us To Your Facebook to Get Your Home Approved! ​Each Puppy Comes Up To Date on Vaccinations, De-wormed, AKC Registration, Complete Pedigree, Vet Check Up (with rectal) along With a Complete Full Puppy Folder, Collar, Toy & Lifetime Breeder Support! ​* NOTE: We DO NOT sell to breeders so please do not ask. ​RESERVED: Hi My Name Is Bear aka Scout! BEAR is an outstanding puppy. He is the 2nd largest puppy in his litter. He is both intelligent, confident and is proving to be very easy to train! He comes from strong bloodlines with many champions, proven to be anything you want him to be. You will absolutely love BEAR! He will be your best friend for life and will offer you both companionship as well as never having to worry when you are in your home! Just look at these huge paws! RESERVED: Hi, My Name Is Tieger aka now Jack! TIEGER is a head turner and quite the looker! This Gorgeous AKC (Rare), Fawn colored handsome boy loves to snuggle and take naps with you. His color will change constantly as he grows but he will favor his mom's colors (Scroll Below) though he is going to be a big boy like both his mom and dad. You and your family will fall in love with him instantly! He comes pre-spoiled, is very well mannered and has the wonderful temperament to go along. He is the complete package! He will become the most magnificent creature you EVER laid your eyes on! You'll be proud to call TIEGER your very own! He will make you an amazing lifelong friend! RESERVED: Hi, My Name Is Panther! Max aka PANTHER will be sure to make that perfect and loving addition that you and your family have been searching for. He is wonderful, smart and an adventurous fellow. Max learns quickly. He pays attention very well and has an amazing temperament. He will be your most loving and committed companion forever! RESERVED: Hi, My Name Is CharlieDog! ​RESERVED: Hi, My Name Is Samson! ​RESERVED: Hi, My Name Is Dolly! ​RESERVED: Hi, My Name Is Anica! ​RESERVED: Hi, My Name Is Gunner! ​These puppies all have amazing temperaments. They are also doing wonderful with their training which starts at a very early in their lives here at NoFearLivesHere K9's! We strive for perfection in bringing you the best German Shepherd baby that our lives have to offer them for 8 short weeks, until the day they go to their extraordinary homes! ​We sleep, eat and breath German Shepherd babies until the last puppy leaves. We absolutely love and feel so blessed that we can give them our total attention, love and care in our home to ensure they are very healthy and happy. Its truly amazing to watch them grow from time of birth into the loving and well mannered puppy that each new family picks up. Its SO exciting to meet the new families, to witness their hearts filled with so much love and to watch each one's eyes light up when they meet their German Shepherd baby for the very first time! ​ That's only one small reason why we remain so committed in raising the best German Shepherd puppies ever! ​NOTE: Since the puppies are older please allow 1 week in between pictures or videos. Personal photos and short videos may be sent upon request. ​Since they are being weaned from their momma we are extremely busy making sure each puppy has the love, attention and care that he/she needs to make sure they have an extraordinary temperament when they go to their magnificent homes. We are constantly feeding, bathing, brushing, paw/pedicures, crate training, playtime, naptime, washing food and water bowls, et... moping floors, washing and drying their blankets, rugs and toys, holding and loving them, beginning their potty training, introducing them to new sounds and much more including new pictures and short videos! We're constantly taking phones calls, literally hundreds of texts and emails for new potential and previous owners. Also we are busy ordering AKC registration papers, pedigree certificates, printing out pedigrees, contracts, endless information needed for new owners to all be collected and placed in a full and complete AKC puppy folder. Then there's the vet visit before they go home. Thank you for your patience and understanding as we are preparing your new family member to be the most remarkable German Shepherd possible here at NoFearLivesHere K9's. You can be proud and feel blessed that you are with out a doubt getting one of the most phenomenal puppies that your money can buy. Because I know we feel the same about the amazing homes and wonderful families we personally have approved and chosen for each one of our babies! Avorah x George's Past Litter. All Turned Out To Be Phenomenal German Shepherds With Amazing Temperaments! Buy Dog Flea & Tick Medicine Today - Shop over 1,000 Brands at Chewy! CLICK HERE FOR PUPPIES PEDIGREE! * NOTE: We DO NOT sell to breeders so please do not ask. *NOTE: Please read over this entire webpage! We get so many questions ask over and over that we can always tell that the potential buyer has not took the time to read over all our info. This is VERY important to us! "Early reservations and deposit are strongly recommended! (Lots of prospective buyers have lost their pup simply because they fail to send out their deposit on time.) This has happened more than once or twice. "Give us a hollar. . .
We love to talk Woof, Woof!" Here, at NoFearLivesHere K9's, We Always Provide 24/7 Lifetime Breeder Support! Whether its our puppy or another breeders puppy, we are always happy to help when we can. Attention: "PENDING means the puppy has been spoken for BUT no deposit has been received yet"
PLEASE NOTE: Until deposit is received your puppy IS NOT reserved! The Puppy Food They Are Currently On. We Highly Recommend You Do Not Change. Click Here To Read ~ ABOUT US PAGE! ~ Microchip is Additional charge! All Our Pups Are AKC Registered Guaranteed! "We Are Always sending Pics & Video clips To the New Owners, Until Time To Go Home"
Extremely gentle with children, easily trained and EXCELLENT protectors! Tessa, with our two grandbabies. In this pic she was expecting pups any day! Reserve Your Baby Today. . .
(with rectal) along With a Complete Full Puppy Folder, Collar, Toy & Lifetime Breeder Support! Note: We highly recommend future training set up for each puppy after he/she gets adjusted to their new home. ***Microchipping is available for an additional charge or we recommend it on your puppy's 1st visit to the vet. "PENDING means the puppy has been spoken for BUT no deposit has been received yet" PLEASE NOTE: Until deposit is received your puppy IS NOT reserved! "All Of Our German Shepherd Dogs Are AKC Registered & AKC Inspected"
These Puppies Always Become Amazing Companion/ Family Members! "These puppies are Extraordinary!" Each one is simply amazing and we feel SO honored to have raised each litter. Each puppy is such a blessing to our family and will be to yours also! CLICK HERE TO VIEW ~PUPPY & OWNERS FROM 2017! TO VIEW EACH PUPPY & OWNERS BY THE YEAR, SCROLL OVER "PAST PUPS"ABOVE, WITH YOUR MOUSE. If You Would Like To View The Past Years Feel Free To Text Us For The Password. Each puppy has been temperament tested since birth. They are super gorgeous and will have started their basic training soon, raised in our home with children, will have excellent house manners and will travel great in the car. They are happy, confident, amazing with children and get along great with other pets! They are beautiful inside and out and are super smart and love to learn. They will up to date on their vaccines and deworming. They come with complete vet health checkup AKC registration, pedigree, health papers, health guarantee, toy, lifetime breeder support, etc. Shop Gifts for All Your Pets at Chewy! (These babies require a $400 deposit to reserve. . . if your home is approved. Sundays are reserved for flights and also pickups. Regardless, if your home is approved we try to work with you the best we can! If you are having difficulty finding the right puppy, Text/call us so we can help you decide which puppy is best for your family! We are located In the Beautiful Mountains of Northeast Alabama, Right On The Georgia & Tennessee Line. To Reserve Your Baby . . .
Testimony: We thought Tony deserved a space here on front row. He has done such wonderful job with Solomon and for his team! Thank you Tony and a big Woof, Woof to Solomon! 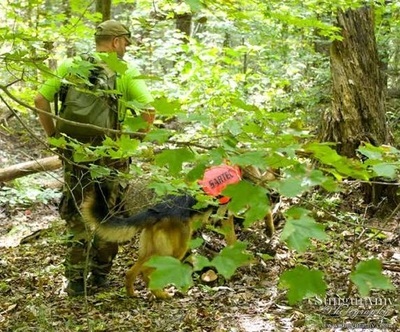 As a service member in Germany I had the fortunate experience of learning from some of the best handlers of German Shepherds, while training two of my own for Schutzhund. After several years of being back in the states and no longer having the company of my two, I began the long arduous task of finding another shepherd. I had spent hours upon hours searching for just the right one. Somehow, I stumbled upon No Fear Lives Here. My first thought was that it was quite the bold name to put on a site. However, after getting the opportunity to speak with Deb and spending some time visiting the dogs, I quickly realized just how fitting the name really was. I knew this was the right place and quickly found the right dog for me. 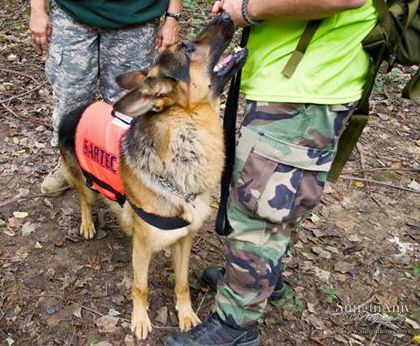 That was Spring of 2012 and today Solomon (formerly Harley), is a certified Search and Rescue K9 with SARTEC out of Madison AL. Solomon's drive and desire to work is impressive, a direct reflection of his lineage to his grandfather Remo, and he attained his certification in a very short amount of time. I get many compliments on Solomon and am always asked where he came from. Whether its a family dog or a working dog that you want, this is the place to get that one to let people know that No Fear Fear Lives Here! Stock up! Save up to 50% on Dog Training Supplies! ​Thank you for visiting our website and for your interest in our K9 German shepherd family. We always consider it a compliment regardless! We welcome you back anytime :) We are always happy to answer any and all questions. Our K9 Family . . . IMAGES ON THESE PAGES ARE THE PROPERTY OF THEIR RESPECTIVE OWNERS AND MAY NOT BE RE-PUBLISHED ANYWHERE ELSE WITHOUT PERMISSION OF NOFEARLIVESHERE K9's.